I’ve been working with Adrian on learning to make the gallon of Koolaid he typically consumes in a day. So far he’s learned…. But I’ve been at this a long time now. Long enough to know that even though we could always be pushing for the next skill, it wouldn’t necessarily be the best thing for us or Adrian. It’s good sometimes to just relax and enjoy what we’ve got. Although sign language will never be an effective means of communication for Adrian due to his inability to sign consistently and precisely, we still use signs with Adrian to augment other means of communication. In trying to get Adrian to sight read words, I made several simple books using sign vocabulary that he already knew. The idea was that he would be able to ‘read’ the books by signing the words he read. 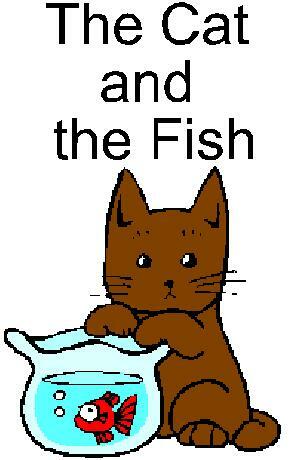 One of the first books was titled “The Cat and The Fish”. Much to my husband’s horror, the book ends like any cat/fish story – with a full kitty tummy and one less character. No matter. Adrian thought it was just as funny as I did. I’ve been adding small things here and there to Adrian’s device including a number key pad and a lunch room page. But I think the most important changes have been to a page called ‘My Phrases’. I’ve racked my brain trying to think of all the things Adrian might say at school to express his feelings to the staff. With his pinching behaviors being the central focus of some members of his team, it’s important that we get Adrian to express himself in different ways as soon as possible. But showing him all the options available to him, his favorite button was the one that says, “Look at me!” He just pressed it over and over and then joyfully stared at me staring at him. Who doesn’t love being the center of attention? It started when Adrian’s speech therapist last year had the brilliant idea to program a button that would make a comment about something that happened during Adrian’s school day. She felt he’d enjoy communicating with us at home about what took place at school. We were only able to use it once, but I think she was on to something. I knew I wanted to do something similar with Adrian’s classroom this year but having the staff simply type in a message for him seemed to be missing the point. I realized that we could easily combine the ‘what happened at school today’ button with the goal of having him type words. I explained the idea to the classroom staff last week and they were all on board. Early this week I began our ‘Home Journal’. I created a notebook and placed removable PECS inside that would allow us to create sentences about things that were going on at home. Fast forward to today. I told the teacher about the messages we’d created. I don’t know how Adrian reacted to being able to play them for his teachers. But she did mention that Adrian was VERY resistant to typing out his message in the ‘School Journal’. He was so upset about doing it that he spit on the aide who was working with him. I’m disappointed that he reacted this way at school when he’d participated willingly here at home. I know the teachers wonder if he’s just trying to get out of work. I can’t say their concern isn’t valid. Adrian’s done things like that in the past. Still, I wonder, can you force communication? Is the point here coercion or connection? I don’t want Adrian to think of writing, typing or communicating negatively. I want him to see these things as useful, purposeful, desirable and even fun. From where I sit now, forcing him to type under these circumstances is less than productive – it’s counterproductive. I think we may have to put the school journal on hold for a bit until Adrian and his team can figure out how to communicate and work together under mutually agreeable terms. I’ve been contemplating the meeting with Adrian’s team last week. As I suspected, Adrian’s pinching habit is causing major problems. I know a lot of it is caused by Adrian’s inability to communicate effectively. After considering the problem for a bit, I’ve decided to take a step back. I sometimes wish I could simply ‘download’ my knowledge of Adrian to his new teachers. There’s so much in his history that I know would change how they look at him. I did provide some of that history at the meeting. But there’s no way to tell it all. As frustrating as that is, it does have an upside. There are two advantages I see in giving them some information and letting them figure out the rest. They might try something new. Without a prescribed solution, they’ve already tried some new things to control his pinching behaviors. You never know when they might find something through trial and error than works better than what we were already doing. The process of figuring him out builds their relationship with him. If I could tell them everything there is to know about Adrian, they wouldn’t ever need to ‘get to know’ him. It’s the nitty gritty stuff that helps build a unique relationship between Adrian and his teachers. So having given the classroom team history and hints, I’m going to leave them to figure out how best to deal with Adrian’s aggressive behaviors at school. Hopefully within a few weeks they will understand Adrian better, have developed relationships with him and will have found some strategies that help them.